Hope you had a good week. ACEC-SC is hard at work preparing for next week’s legislative reception, the Engineering Excellence Awards Gala, theACEC-SC/SC Winter Meeting on February 12, 2019, the March 15, 2019 Membership Meeting and Strategic Planning Retreat March 15-17, 2019 at the Westin Poinsette in Greenville, SC. 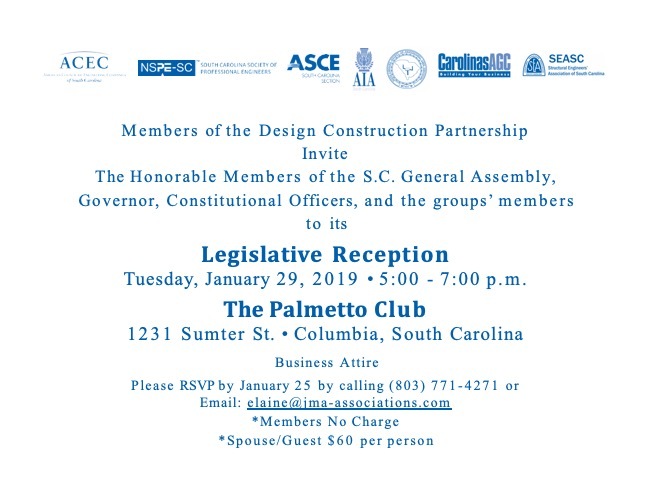 Speaking of the Legislative Reception on Tuesday January 29, 2019 at the Palmetto Club from 5:00-7:30PM, make sure you have RSVP’d by days end. Please take a minute to familiarize yourself with the issues we will be bringing forward to our legislators. Click here to see the Design/Construction Partnership’s current issues. We did see some movement at the State House this week. After working tirelessly to get co-sponsors for the joint and several liability bill, “Fair Share Bill”, it was finally introduced yesterday with over 50 co-sponsors. We and the South Carolina Coalition for Lawsuit Reform (SCCLR), are hoping with all of the Committee Chairs as sponsors this bill, H. 3758, will move quickly. This legislation simply corrects language in the statute to properly codify the public policy intent and compromise reached by the General Assembly in 2005. The bill properly allocates fault to all parties in a civil action to recover damages from an accident.